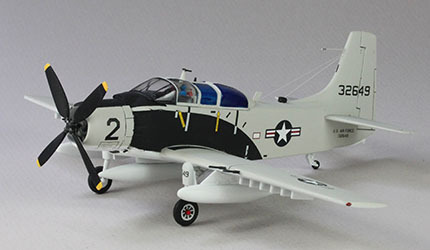 The Douglas A-1 Skyraider was designed in the later part of WWII as a single place, single engine fighter-bomber for the US Navy. It served the Navy well in that role during the Korean conflict but was replaced as jet fighter-bombers came on line in the mid-'50s. The wide-body Skyraiders served on in the Navy as surveillance aircraft for many more years. As the Viet Nam conflict grew in the early '60s, the USAF needed a "bomb truck" that could loiter over a target area, un-refueled, for extended periods. The "Spad," as it came to be known by the flight crews, fitted AF requirements. 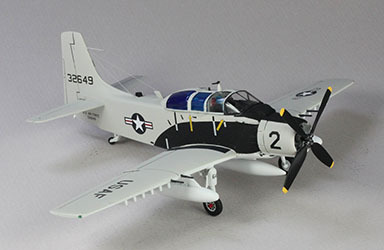 The A-1E was soon recalled from the boneyard, refurbished and sent to war in South East Asia in a counter insurgency (COIN) and close air support (CAS) role. 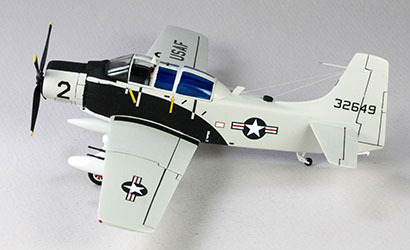 On 10 March 1966, the multi-place A-1E modeled here, 52-132649, was flown by Major Bernie Fisher on a CAS mission over South Viet Nam that resulted in Fisher landing under heavy enemy fire, and picking up a downed fellow pilot. For this selfless and heroic act, Fisher received the Congressional Medal of Honor, the nation's highest award for bravery under fire. Fisher's Spad, heavily damaged in further combat action, was sent to the National Museum of the US Air Force in 1968. The restored aircraft is now on display at NMUSAF, Wright Patterson AFB OH. More information and photos may be found here. 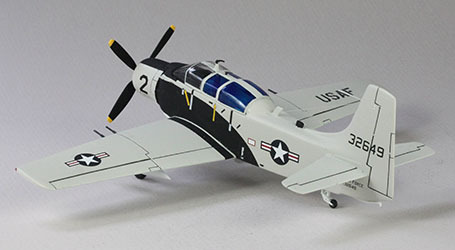 The venerable Monogram 1/72 kit of the Douglas A-1E Skyraider was for many years the only wide-body or station wagon version of the aircraft available. Reboxed by Revell a few years ago, it continues to be a reasonably accurate, if simplified, kit of the multi-place Spad. It has raised panel lines and molded-on weapons pylons and a basic representation of the engine. Not much cockpit detail under all that clear styrene, but lots of room for someone with AMS to go nuts! All that said, the model goes together well. Out of the box, there are no huge gaps, warping or alignment problems. 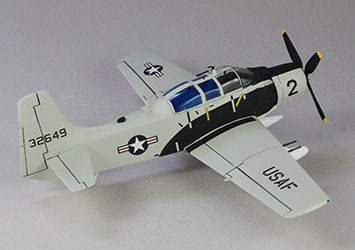 I wanted a quick build of Major Fisher's aircraft for my Medal of Honor model collection using the excellent Caracal Models A-1E Skyraider decal sheet #CD72053, which includes # 649, Fisher's Spad. Assembly was easy and quick. 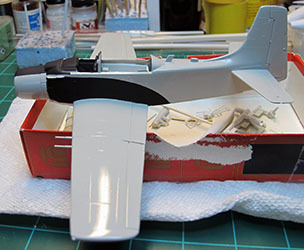 I didn't add anything except some stretched sprue wire antennas between the fuselage and tail, after painting and decaling, per the existing photos. 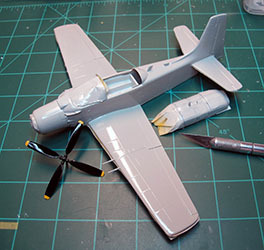 I airbrushed Model Master gloss Gull Gray on top over MM gloss White on the bottom of the fuselage and wings. After decaling, I sealed everything with Future Acrylic Floor wax applied with a brush. 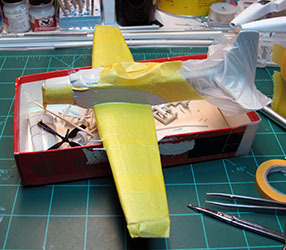 I highlighted the flight controls and wing folds with thin gray acrylic and a lead pencil. Lastly, I airbrushed MM Flat to kill the shine on everything but the windscreen and canopy glass. 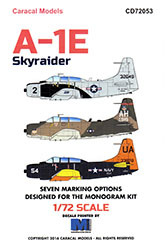 I enjoyed building the Monogram A-1E again. It goes together well and provides an excellent platform for the excellent Caracal decals. Recommended.